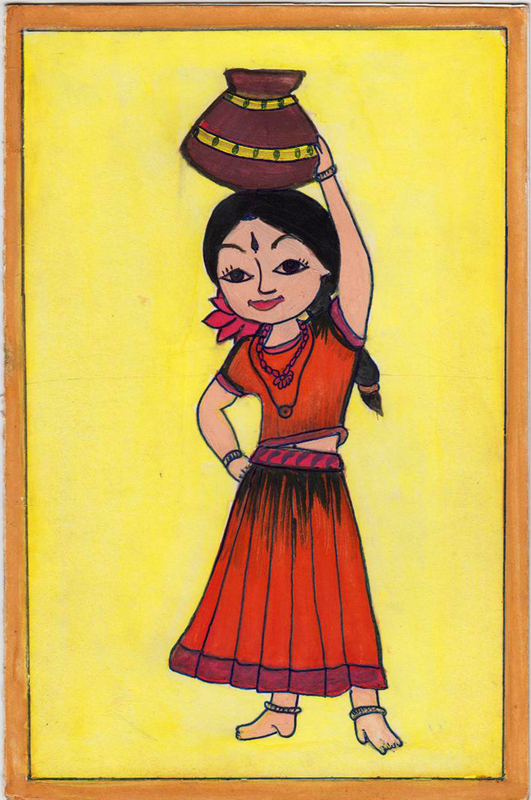 The card was drawn by a Chitra Ullas Nayak, an eight grade student at the Shanbhag School in Kumta. Preparing greetings is part of their learning of our Indian heritage at the school. Every year I get one of their cards, but this year on I’ll post them here to acknowledge their contributions. Do you think I should make it a regular contest and have a cash prize? A good incentive for the students to be creative on the card, and make it on topic? What do you think? A wonderful writeup on the significance of Makar Sankranti. Here are one of my earlier Makar Sankranti Greetings, an awesome recipe for Til (Sesame) laddoos, and a nice write-up on Pongal. Beautiful piece of art. Congratulations to the young artist.Must be rewarded. Hi Arun it was indeed very beautiful and creative piece of art. delighted to know that kids from kumta are also shining in the feild of art. frankly speaking i am also from kumta chitrigi to be precise from bhandarkar family currently living in Dubai. Any news from kumta brings back nostalgia . I .hadn’t heard of shanbhag school earlier. i knew abt Gib high school , nirmala convent and kannad shala. where our cousins would go. happy sankranti to you and your family. Please keep up the good work. Happy Sankranti to you too! Very nice artwork by the girl and worth rewarding! She has made that picture look so elegant! Amazing they hand made/painted the card. Will have to give her an award for that. The art is very beautiful and very symbolic. Your idea to reward such talents in the form of an annual contest is very good. Thank you Ramesh; looks like an annual contest is the consensus. Will talk to school management and make it happen next year. We should be encouraging such talents. Thank you for sharing your thoughts here and absolutely yes. I am heading to Kumta next month and will give the student a cash/book prize. Will talk to management about making this a contest next year. Perhaps one for a greetings and another for an essay. Thank you and Happy Sankranti. It is one of the holiest days in our calender. I return the Greetings with prayers to God SURYA to bless you all with Prosperity and Health. 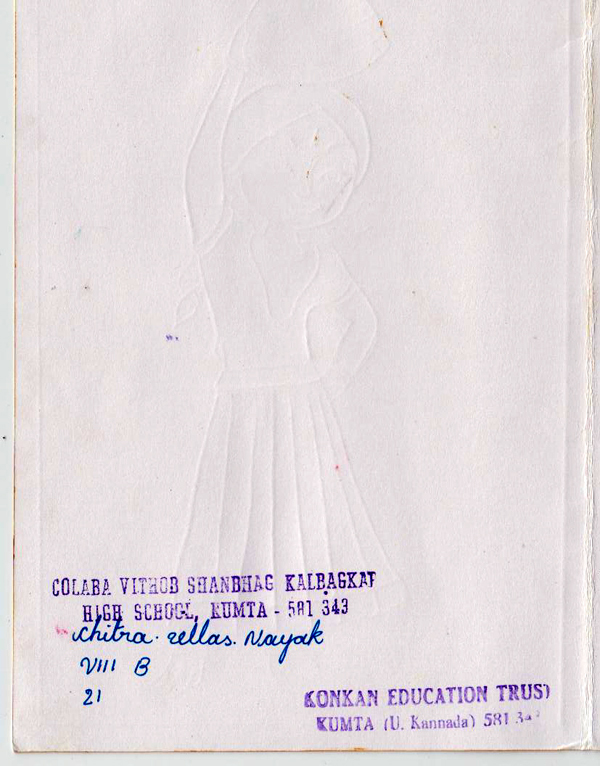 Chitra Nayak has inherent talents for the drawing/painting. God Surya bless her and her family also with Vidya, Joy and Prosperity. THank you for sharing your thoughts here. It is such a joyous occasion in mumbai (and india in general); here it just melts into a dreary winter day. Our family made til-gul (the white ones) and the ladoos ~ good old days. Yes, will reward Chitra Nayak in some way. Best Wishes for Sankranti to you. so creative, and beautiful art! should definitely be rewarded!! and right about the reward. Will be heading there next month, so will make a cash reward or buy them a pic encyclopedia or something.